Non-campers and backpackers might be wondering what on earth a tent footprint is. No, it’s not a shoe for the tent but is a type of ground cloth for your tent to prevent wear and tear. It’s basically a protective layer between the tent and the ground to help preserve your tent. Aside from this, many campers use it as a mat where they put their shoes to keep the inside of the tent clean. You can buy them in many camping and outdoor store or you can make a DIY tent footprint. Footprints are cheap and replaceable but do an important job like preventing punctures and tears. Some argue that they have a sleeping pad to make sleeping on the ground bearable. However, not all camping ground is smooth. Sometimes there are pebbles, small sticks, pine cone and other debris that can make sleep uncomfortable. What’s more they can rip apart your expensive tent floor rendering it useless unless you know how to patch one up while you’re in the woods. Not to mention that there are areas that can stain your tent. A good solution to this problem is to use a tent footprint. They are very inexpensive even if you buy them. You can also make them at home using different materials. If you make them from good quality materials, your footprint can last a long time as it can be reused every time you go camping. Tent footprints give an extra layer of protection for your tent. If you make a big one, they can provide space for you to sit outside your tent, somewhere to put your bags, shoes and other items you want to keep off the ground. Plus they can make tent cleaning easier since it prevents soil and mud from entering the tent. The fabric of your tent footprint can help determine whether it will last a long time. 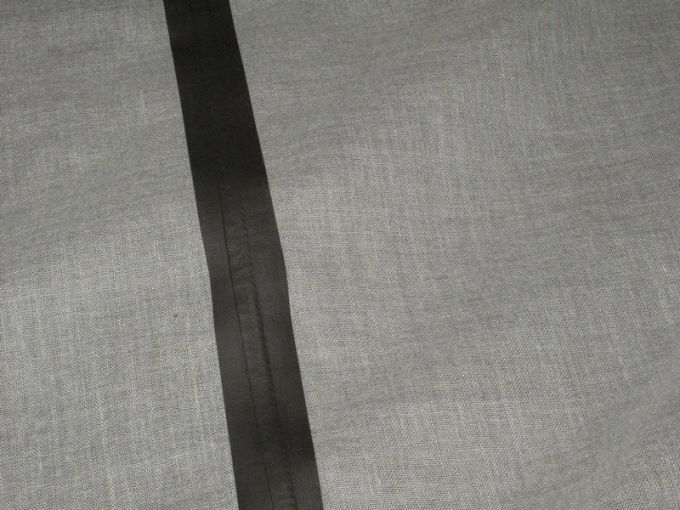 Many people are wondering what kind of fabric works best as a tent footprint. Here are some of the most popular fabric used by backpackers and campers. Tarp is cheap and can be found anywhere. Many backpackers and campers like tarp because it is waterproof and flexible. Aside from this, tarp can be used as an emergency shelter, rain fly or a sheet to cover an area where everybody can sit around while keep clean. While tarp makes a good tent footprint material, it is not very durable and is also heavy. There are campers who feel that tarp is not very durable and disintegrates after a few uses. If the weight of the tarp is not an issue for you and you don’t mind making one after several years then tarp is a good an inexpensive to use for your tent footprint. See our review of the best tarp to give you more choices and options. Window wrap is the plastic covering you blow dry on your window for insulation during winter. One sheet can last one season depending on how often you use it. Popular brands include Duck Brand Window/Door Shrink Film and Frost King Stretch Window Kit. Backpackers love to use window wrap because they are inexpensive, waterproof and very lightweight. Depending on the brand you buy, some of them will be narrow so you need to tape a couple together to get the right size. However, window wraps are just plastic and are prone to tears and punctures especially if you camp in rocky ground. Expect to replace your window wrap tent footprint every year to ensure proper protection. They don’t only protect furniture from dust and paint when you’re re-doing your house. They can also be used as tent footprints. There are many different kinds but the best to use are the non-woven variety because they are usually coated to prevent paint penetration. In the case of camping, the coating will protect the tent from water seepage. You can buy them pre-cut which is great since because they will be ready to use especially if you find a size near the dimensions of your tent. Dust sheets are strong and affordable but a bit heavy. Tyvek sheets are made from high density polyethylene (HDPE). It is water-resistant, breathable, strong, lightweight and resistant to tearing. These features make the Tyvek sheet a favorite material among backpackers and campers. Tyvek is also the material used by brand manufacturers when making tent footprints. They are available in shops like Home Depot or Lowes or online through Amazon. Some sellers sell by the yard, others by roll so check out how much you need before buying. Making your own tent footprint is not hard. You just need a plan and to gather the necessary materials to make your build easier. Here are the materials needed for a DIY tent footprint. There are many different designs when it comes to tent footprints. Some people like to make theirs with an extra flap in front so that when it is laid flat, they have a semi-circle in front of the entrance that looks like a welcome mat. This area can be used to put shoes so that they don’t need to enter the tent. Others just like to make a rectangle with extra space around to ensure that the whole tent is protected. Whatever your design is, you need to make a plan so that you can measure and cut your tent correctly. Let’s say that you want to make a basic rectangle one to fit the base of your tent. Start by measuring the base. For example, it measures 86×52-42″ as it is tapered in design. Next, add 3 inches on the corners to reinforce where you will be putting in the grommets. Following the measurement of the tent base plus the 3 inches, you will need approximately 92×58″ of Tyvek. The grommets on the corners can be used to make sure the footprint stays put by looping a nylon cord on the grommet to attach to the tent through the stakes. It’s best that you get to work in a flat area where you can lay the whole sheet for cutting. This will help you mark the areas that need to be cut accurately. It’s also a good idea to lay out the tent poles and to clearly mark the area so that you know where they will sit on the sheet. Once you’re done laying the Tyvek sheet, make sure that it is taut and the tent is staked properly. Using your measurements, draw an outline with your marker. It helps if you have an extra pair of hands to hold the tape measure or ruler while doing this. An alternative is to set up your tent on top of the Tyvek sheet and to draw an outline with at least 3 inches allowance on all sides so that when cut the sheet is wider than the tent. Once you’re done drawing the outline, cut the sheet with a sharp pair of scissors. If you’ve measured your tent and sheet correctly, they should fit each other snugly. In order to make the tent footprint stronger, tape the edges of the seams. Use the contact cement as instructed and tape around the extra area to make your footprint look nice and to reinforce it. An easy way is to pre-fold the fabric before applying the cement. First, fold the fabric and roll a rolling pin on the area you plan to apply the cement. This will flatten the fabric making it easy for you to make the edges straight. Once the area has been rolled flat, apply the cement and then roll the pin again for better contact. Repeat this process around the Tyvek sheet so that your footprint is strong and can resist tears and punctures. Using your grommet kit, apply the grommets to all corners of your tent footprint. Grommet kits have everything you need so you just need to follow instructions and your grommet should be in correctly. If you don’t have a grommet kit, you can apply the grommet by marking the area of the corner of the tent where you want your grommet to be. The area should coincide with the tent pole locations. Lay the male part of the grommet on the fabric and trace the inner part of the hole using a pencil. Repeat this process on all four corners. Using your pencil, trace an X-mark on the middle of the circles and cut the mark using the box cutter or Xacto knife. Insert the male part of the grommet through the hole you just made. Place the female portion on top of the male portion that’s sticking out of the hole. Put the setter on top of the female and use your hammer to give the setter a couple of good whacks from the top. Repeat for the other corners. Now that your grommet is set, tie loops of nylon cord through the holes to secure your tent footprint. Do a trial set up with your tent fully pitched on top of the footprint so that you can measure the length of the nylon cords. Now you’re all done. Let’s say that you forgot your tent footprint at home and now you need to use materials available to you to protect your tent from pebbles or moisture. The easiest way of doing so is to check if you have tarp with you. Just lay the tarp on the ground and pitch your tent on top of it. If you don’t have a tarp, you can make use of garbage bags you brought along with you. Here’s how to do it. Determine the number of garbage bags you need to cover your tent. If you have limited number of bags, cut the bags open and spread them apart. Tape them together so that it forms a big rectangle and pitch your tent on top. It will be trickier without tape but you can overlap the bags and carefully lay the tent on top of the untapped bags and slowly erect the tent. You won’t be able to move much but it’s better than sleeping on wet ground. You can’t secure the garbage bag with nylons and tent stakes since there are no grommets. In this case, you can prevent the bags from moving by securing the corners with a rock. It’s a bigger challenge if you don’t have a garbage bag or any waterproof material to make your tent footprint. Natural material is not waterproof many of them can snag the tent bottom and damage it. If you’re camping without a footprint, it’s best to do so if you have a sleeping pad and if your tent bottom is waterproof. You can choose whatever handy material you have at home to make your own tent footprint. If you have used tarp, old dust cloths or extra window wraps, you can easily make your own without leaving your house and spending any money. Choosing whatever material that is available to you is very convenient and inexpensive. Manufacturers also make tent footprints from different materials. Buying a footprint lets you access more variety of materials and construction. Depending on the readiness of your materials, construction of a footprint can take a few hours. If you have experience before, it can take even faster. Buying a footprint is very convenient. In fact, you don’t have to leave your house thanks to the internet. Many camping gear manufacturers have websites or you can check sites like Amazon or eBay for the best footprint for your camping or backpacking lifestyle. DIYing a footprint is very affordable. Depending on the materials used, you can make one for as little as $20. If you already have materials or want to recycle an old tarp or dust cloth, then you can cut down on costs. Store-bought tent footprints can be expensive depending on material and manufacturer. However, they tend to be more expensive than DIY ones. You might not always need a footprint, but it can save your tent from tearing, punctures and from getting stained. Sometimes we can’t see where we pitch our tent especially if it’s getting dark. Small pebbles, roots, debris, sticks and other sharp debris can puncture holes into expensive tents. Also, not all tents have waterproof flooring and a footprint can provide waterproof protection and insulation from the cold ground. For some people a tent footprint is just added weight they don’t need when they’re lugging their backpacks. However, they are very handy to have around during a rainstorm or when you’re camping on cold or rocky ground. Imagine entering your tent all wet and muddy. With a tent footprint, you can leave your muddy boots outside or shake off excess water before entering the tent. It helps keep the interior clean and dry. Many commercial tent footprint offerings are overpriced and made from the same materials you can find in camping stores or online. Making your own tent footprint is a great way to save money while protecting your camping investment. It is an easy thing to do that can be completed in a couple of hours. All it takes is research and you can be on your way to making your own tent footprint. Be sure to read our article on how to pitch a tent for more insight. Do you think you have what it takes to make your own tent footprint, or will you be buying one? Tell us why you think making is better than buying by leaving us your comments below.